CRAZY COOL GROOVY!!! 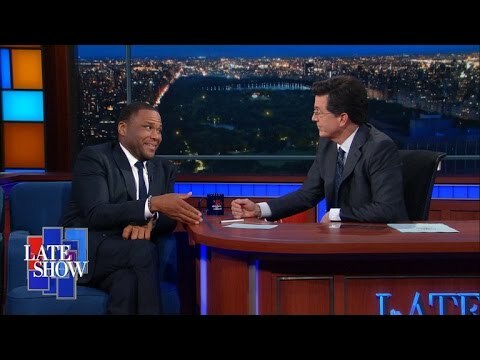 : ANTHONY ANDERSON On STEPHEN COLBERT!!! Last week in NYC, ABC sitcom BLACK*ISH star ANTHONY ANDERSON was at the ED SULLIVAN THEATER for an appearance on CBS late night show, The LATE SOW With STEPHEN COLBERT!!! During the session, Anthony and Stephen discussed BLACK-ISH receiving a 2016 PEABODY AWARD, President and First Lady BARACK and MICHELLE OBAMA publicly stating that Black*ish is one of their favorite shows, and how Anthony wishes that OBAMA could run for another eight-year term.